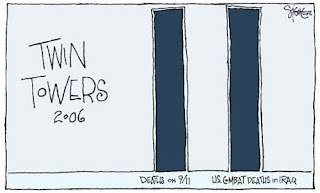 A recent political cartoon (left) highlights the fact that the number of combat deaths in Iraq has now exceeded the number of people killed in the terrorist attacks of September 11, 2001. Interesting statistic, but irrelevant. Not only is the statistic irrelevant, the use of the twin towers graphic/bar graph is insulting to the memories of those who died at the Pentagon and Shanksville. Why is this analogy irrelevant? Another line of reasoning probably lost on those trying to make this faulty analogy. 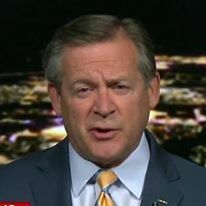 Many Americans - and I dare say including those who are trumpeting this statistic - believe that Iraq had nothing to with the events of September 11, 2001. If that is the case (and I believe that it is), there should be no comparison of the deaths in the two unrelated events. You can't have it both ways. Bottom line: We all mourn the loss of our young men and women in both Iraq and Afghanistan. We continue to mourn the loss of our fellow citizens and friends on September 11, 2001. Don't insult their memories with cheap shots like this.